Schaeffer Marketing Group went through some major expansion in 2014! In January, Tom Luedde came on board from Ajax Electrical Sales, along with several well respected industry leading lines such as Bridgeport Fittings, LS Cable, Nehring, Jefferson Electric, Austin Enclosures, Thiel and Whitney Blake. Tom retired at the end of 2016. Tom is a US veteran and we are thankful for his service and proud to have him part of our team for three years! Payne Birk joined the sales team in late 2013, in anticipation of new lines to come. Payne specializes in handling Bridgeport fittings, Ouellet electric heat, and NSI. Email Payne for quotes, orders and inquiries. Melissa Berry joined in January 2016 for outside sales and Darla Bair joined in December 2016 for outside and specification sales. David Cole joined in July 2018 for outside sales. Schaeffer Marketing Group is pleased to represent the following new lines: Audacy Lighting Controls, Razrlites, Superior Essex Cable, Nehring, Bridgeport, Austin Enclosures, Jefferson Transformer, Whitney Blake, Thiel, Wago, Deco, and Douglas Lighting Controls . See our linecard or our What’s Hot page for more info. Ameren Missouri representatives and Trade Allies from across the energy efficiency industry gathered, April 21, to celebrate a year of success in saving customers energy and money with the Ameren Missouri BizSavers® program. 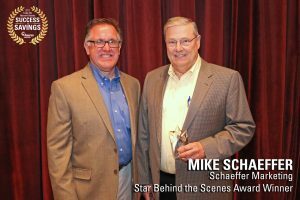 Mike Schaeffer won one of the Stars Behind the Scenes Awards. Kris Steiger won the 2016 Creating Contractor Demand award from Bridgeport Fittings in the western region in recognition of her efforts promoting labor saving new products. 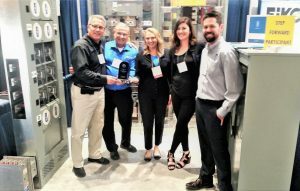 AMP wins the St. Louis EBMI Expo’s Best Booth (Single Booth) Award. Mike Schaeffer was awarded the 2014 Michael A. Postiglione Award from the Electrical Board of Missouri and Illinois as someone that goes “above and beyond” to ensure that the Electrical Board remains a successful organization. John McGauley was awarded with Picoma Industries’ Inside Salesperson of the Year. Schaeffer Marketing Group received Platinum Level status with IMARK for 2012 for all of the marketing and service support provided in the market. We continue to support IMARK marketing activities and to help all of our partners achieve top success! At the NEMRA Conference in February of 2012, Kris Steiger received the Gem Rising Star Award from Electrical Wholesaling Magazine. View the full article here. The GEM Rising Star Award, recognizes those independent reps whose early careers and industry contributions show promise of leadership. This award is a great honor! At the NEMRA Conference in February of 2011, Inside Salesperson Jamie Radin was named the Inside Salesperson of the Year for Universal Lighting Technologies. Jamie received this honor because of her commitment to accuracy, excellent customer service, and thorough with factory personnel. She has learned both operational and technical sides of this line and offers our customers accurate, timely responses. In addition, Mike Schaeffer was named ULT’s Rep. Outside Salesperson of the Year award for his efforts in the energy retrofit market and for outstanding growth in ULT sales. Congrats, Mike and Jamie! On January 13, 2011, at the 2nd Annual Ameren MO Trade Ally Awards Banquet, Schaeffer Marketing Group received the Trade Ally of the Year Award. It is a true honor. We continue our work to save our customers energy costs and to provide better, more efficient lighting. Check out our Lighting Solutions page for more information on how we can help do this for you or your customer. Schaeffer Marketing Group continues our work in the energy efficiency field, which began about 20 years ago when we began representing ULT (then Magnetek). Check out our Energy Efficiency page to see how we can help you in this market.